Objective: To examine the pricing trajectories in the United States of disease-modifying therapies (DMT) for multiple sclerosis (MS) over the last 20 years and assess the influences on rising prices. Methods: We estimated the trend in annual drug costs for 9 DMTs using published drug pricing data from 1993 to 2013. We compared changes in DMT costs to general and prescription drug inflation during the same period. We also compared the cost trajectories for first-generation MS DMTs interferon (IFN)–β-1b, IFN-β-1a IM, and glatiramer acetate with contemporaneously approved biologic tumor necrosis factor (TNF) inhibitors. Results: First-generation DMTs, originally costing $8,000 to $11,000, now cost about $60,000 per year. Costs for these agents have increased annually at rates 5 to 7 times higher than prescription drug inflation. Newer DMTs commonly entered the market with a cost 25%–60% higher than existing DMTs. 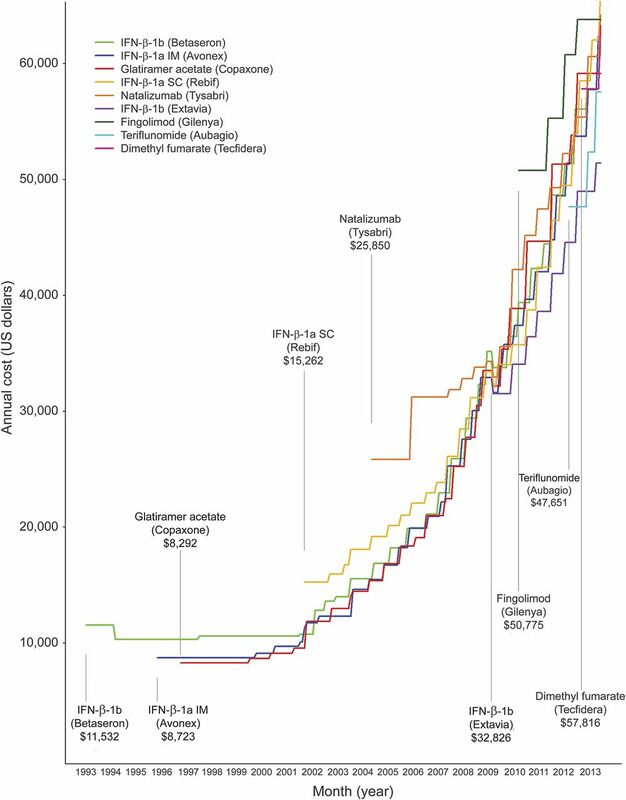 Significant increases in the cost trajectory of the first-generation DMTs occurred following the Food and Drug Administration approvals of IFN-β-1a SC (2002) and natalizumab (reintroduced 2006) and remained high following introduction of fingolimod (2010). Similar changes did not occur with TNF inhibitor biologics during these time intervals. DMT costs in the United States currently are 2 to 3 times higher than in other comparable countries. Conclusions: MS DMT costs have accelerated at rates well beyond inflation and substantially above rates observed for drugs in a similar biologic class. There is an urgent need for clinicians, payers, and manufacturers in the United States to confront the soaring costs of DMTs. The objectives of this study were to (1) investigate our impression that costs for all MS DMTs have increased dramatically since 2002, (2) explore the relationship between the release of newer DMTs and the trend in costs for older DMTs, and (3) compare DMT costs in the United States to those in other countries. This study suggests the need for the neurology community to advocate for changes in the pricing of MS treatments. Next, we compared the median annual cost trends for first-generation MS DMTs IFN-β-1b, IFN-β-1a IM, and glatiramer acetate to the contemporaneously approved biologic tumor necrosis factor (TNF) inhibitors etanercept (Enbrel; Amgen, Thousand Oaks, CA) and adalimumab (Humira; AbbVie, North Chicago, IL) using segmented regression analyses.11 We computed annual costs for TNF inhibitors using the same approach described for the MS drugs based on FDA-approved doses for rheumatoid arthritis. Annual costs were estimated quarterly beginning the fourth quarter of 1998 (the quarter etanercept was approved) until the fourth quarter of 2013 (61 total quarters). Four major periods of change were examined: (1) a baseline period preceding the approval of IFN-β-1a SC (Rebif; EMD Serono, Rockland, MA) (fourth quarter 1998 to first quarter 2002); (2) a period from the approval of IFN-β-1a SC to the re-introduction of natalizumab (Tysabri; Biogen Idec) (second quarter 2002 to second quarter 2006); (3) a period from the re-introduction of natalizumab to the approval of fingolimod (Gilenya; Novartis Pharmaceuticals, East Hanover, NJ) (third quarter 2006 to third quarter 2010); and (4) a period following the approval of fingolimod (fourth quarter 2010 to fourth quarter 2013). We selected the re-introduction date for natalizumab (June 2006–second quarter 2006) because it was only available for 2 months before marketing was suspended in 2005 to evaluate the risks of progressive multifocal leukoencephalopathy. The general form of the segmented regression model (without interaction parameterization) was log(Yt) = β0 + β1 × Timet + β2 × Rebift + β3 × Time Rebift + β4 × Tysabrit + β5 × Time Tysabrit + β6 × Gilenyat + β7 × Time Gilenyat + β8 × DrugType + et. We log-transformed the dependent variable annual cost because initial plots of quarterly data were nonlinear. Because of this, the estimated β-coefficients are interpreted as a percent change.12 For each period, we report the quarterly percentage change (trend) in median costs for DMTs and TNF inhibitors individually and relative to each other. Statistical analyses were performed using PROC AUTOREG in SAS version 9.2 (SAS Institute, Cary, NC). Finally, we compared the most recent annual cost of therapy for each DMT to US dollar-adjusted costs from the United Kingdom, Canada, and Australia, a convenience sample of developed countries with accessible cost data. The following conversion rates (as of April 2, 2014) for cost data were applied: Canada (0.91), United Kingdom (1.66), Australia (0.92). In the United Kingdom, the National Health Service publishes net prices in the British National Formulary.13 Canadian drug costs were estimated using drug benefit prices published through Ontario's Exceptional Access Program, although costs can vary by province.14 Drug costs in Australia are listed in an online compendium of the Australian Pharmaceutical Benefit Scheme and represent agreed-upon prices paid by the Commonwealth of Australia.15 We also examined costs paid by the US Department of Veterans Affairs (VA) because of their ability to negotiate discounts directly with manufacturers.16 VA costs were estimated using Big Four pricing (or Federal Supply Schedule price if no Big Four price was listed) available through the online VA National Formulary.16 For comparative purposes, we further adjusted US costs to account for federally mandated rebates paid to the Medicaid program.17,18 Appendix e-1 on the Neurology® Web site at Neurology.org contains details of our cost and statistical modeling methods. First-generation DMTs IFN-β-1b, IFN-β-1a IM, and glatiramer acetate were introduced with annual acquisition costs between $8,292 and $11,532 (table 1). Over subsequent decades, costs for these DMTs rose on average 21%–36% annually. Costs of the most recently approved oral agents fingolimod, teriflunomide (Aubagio; Genzyme), and dimethyl fumarate (Tecfidera; Biogen Idec) have increased 8%–17% annually since their approval. In contrast, general and prescription drug inflation only increased 3%–5% per year during the same period. The acquisition cost of IFN-β-1b, the oldest DMT on the market, is now $61,529 a year, roughly 6 times its original cost. The cost trajectories for IFN-β-1a IM and glatiramer acetate were similar. Without accounting for any potential manufacturer rebates, there are currently no MS DMTs with an annual cost less than $50,000 per year. The dramatic increase in costs of the first-generation DMTs was not uniform over the last 20 years. Costs for first-generation DMTs increased modestly between 1993 and 2001 (figure 1). IFN-β-1a SC, a recombinant IFN-β similar to IFN-β-1b and IFN-β-1a IM, entered the market in March 2002 with an annual cost of $15,262, 30%–60% higher than the 3 other available DMTs. The annual cost of natalizumab, the first monoclonal antibody for MS, at initial release (November 2004) was $25,850, over 50% higher than IFN-β-1b, IFN-β-1a IM, and glatiramer acetate. Similarly, fingolimod entered the market in 2010 with an annual cost of $50,775, over 25% higher than IFN-β-1b, IFN-β-1a IM, and glatiramer acetate. We sought to determine whether the introduction of new MS DMTs influenced the rate of increase in cost for the first-generation DMTs and, as a comparison, used changes in the cost of TNF inhibitors (figure 2). 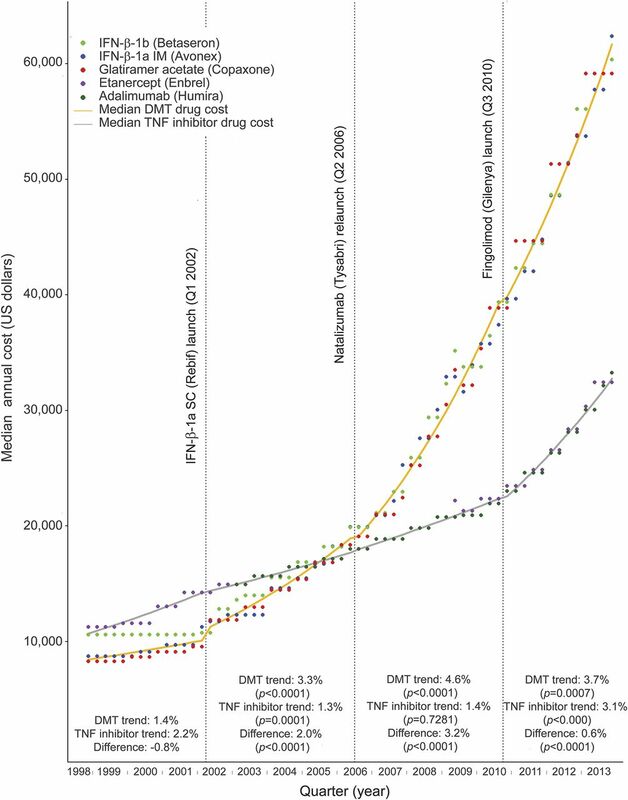 During the baseline period of 1998–2001, costs for DMTs and TNF inhibitors increased significantly by 1.4% (p < 0.0001) and 2.2% (p < 0.0001) per quarter, respectively. During this period, the quarterly rate of increase was significantly higher for the TNF inhibitors (p = 0.0001). Following the introduction of IFN-β-1a SC, the trend in costs for first-generation DMTs increased significantly to 3.3% per quarter (p < 0.0001 for change in trend). In contrast, the rate of growth for the TNF inhibitors decreased significantly to 1.3% per quarter (p = 0.0001 for change in trend) and was statistically lower than the DMT trend change (p < 0.0001 for change in trend interaction). The re-introduction of natalizumab in 2006 was followed by another significant increase in the trend of first-generation DMT costs to 4.6% per quarter (p < 0.0001 for change in trend). During the same period, there was no significant change in the trend for the TNF inhibitors and the difference between the 2 classes was statistically significant (p < 0.0001 for change in trend interaction). Fingolimod was approved in the third quarter of 2010. Although growth in first-generation DMT costs moderated to 3.7% per quarter, it remained significantly above the quarterly growth rate for the TNF inhibitors trend, which increased to 3.1% per quarter (p = 0.0183 for period trend interaction). After accounting for federally mandated Medicaid rebates, annual costs for DMTs in the United States ranged from $41,078 for IFN-β-1b (Extavia; Novartis Pharmaceuticals) to $53,032 for IFN-β-1a SC. Annual DMT costs were often more than 70% lower in the 3 comparator countries (table 2). Costs for the VA were, on average, 36% less than those paid by Medicaid, but ranged from a nearly 80% discount for IFN-β-1b to a 19% discount for fingolimod. This study documents the alarming rise in costs for MS DMTs in the United States since 2002. While we would expect that legitimate advances, such as the development of oral DMTs, might garner higher prices, the escalation in costs for first-generation agents that have been available for up to 2 decades is puzzling. Our analyses show that cost increases for IFN-β-1b, IFN-β-1a IM, and glatiramer acetate were many times higher than prescription drug inflation. First-generation MS DMT costs substantially outpaced those for a contemporaneous class of TNF inhibitor biologic agents, accelerating upwards following introduction of each new MS DMT. These results suggest that the dramatic increases in the costs of the first-generation DMTs may have been a response to the introduction of competing treatments with higher prices. The reasons for this are unclear. Classic economic theory asserts that competition should reduce or stabilize costs for the consumer as more products enter the market. However, our data suggest prices of existing DMTs paradoxically rise, quickly matching prices set by the newest competitor. Costs of MS DMTs are substantially higher in the US market than in the other countries we highlight, suggesting the dramatic increases in costs in the United States are not demanded by increases in manufacturing costs or other changes out of the control of the pharmaceutical industry. Generic drugs are one of the most effective checks on rising drug costs in the United States.26 However, most MS DMTs are complex biologic agents and not exposed to price competition from generics. The Biologics Price Competition and Innovation Act of 2009 was intended to develop a generic pathway for biologics through the approval of biosimilars. Because the evidentiary requirement for a biosimilar is substantially higher than for small-molecule agents, biosimilar applications have been slow to emerge.27 Historically, the pharmaceutical industry has fought efforts to undermine their branded monopolies through the traditional Hatch-Waxman generic drug pathway.28 Teva Pharmaceuticals, which manufactures a variety of generic small-molecule drugs, has aggressively pursued several strategies to mitigate potential financial losses following the expiration of its patents on glatiramer acetate in May 2014. Patent infringement lawsuits brought against Momenta Pharmaceuticals by Teva threaten to delay the release of a generic version of glatiramer acetate.29 In addition, through a process commonly known as evergreening, Teva has been actively converting current glatiramer acetate patients to a recently approved higher dose 3 times a week formulation in an effort to protect their franchise.4,30,31 Barriers and regulatory loopholes make economic relief in the form of generic competition unlikely in the near future. The primary limitation to our analysis concerns the estimation of drug costs. As previously noted, third-party reimbursement of pharmaceuticals is not transparent, and actual costs are often driven by proprietary contractual discounts and rebates. Therefore, the list price, commonly estimated by AWP or WAC, frequently does not reflect the ultimate cost to the payer net these discounts and rebates. With a few exceptions (most notably the VA), the US Medicaid program is legally entitled to receive best prices on medications in the United States. Although we have attempted to estimate net costs to a typical state Medicaid program by adjusting for average rebates, the actual rebate amounts are not publicly available and therefore the actual costs are not known. The high cost of MS DMTs in the United States is producing a cascade of negative effects upon patients with MS and their medical care. In what appears to be a direct response to the high cost of these drugs, insurance carriers have developed tiered formularies requiring step-wise DMT trials, with the tiers apparently determined by preferential pricing contracts rather than any objective analysis of risks and benefits of the various therapies.32,33 In our experience, initial denials of coverage for DMTs for both new and established patients are occurring much more frequently now than in years past, requiring multiple approval steps for patients and their neurologists. Our results shed light on systemic problems with pharmaceutical pricing in the United States, with relevance beyond drugs for MS. The escalating costs of specialty pharmaceuticals for conditions such as MS, cancer, and hepatitis C have been a growing concern among health care payers, policy-makers, clinicians, and patients.34,35 Recently, some in the medical community have begun to question the ethics of our current free-market drug pricing system and to acknowledge that exorbitant pricing for drugs is a major burden on our already stressed health care system.20,34,36 While it is important for neurologists and MS advocacy groups to work on maintaining access for patients to all the MS DMTs, it may be even more critical to address DMT costs as a root cause of the access issues. Recent cost-utility studies suggest the incremental cost per quality-adjusted life-year (QALY) for MS DMTs relative to supportive care are high, with one analysis reporting estimates in excess of $900,000 per QALY, several fold higher than traditionally accepted thresholds of what is believed to be cost-effective.37,–,39 One cost-effectiveness study found that the cost to prevent an MS relapse exceeded $80,000 for several IFNs and glatiramer acetate.40 Dramatic increases in the cost of MS DMTs without significant improvements in efficacy will only further reduce the cost-effectiveness of these drugs. Sensitivity analyses suggest that incremental cost-effectiveness ratios for MS DMTs would approach accepted thresholds if US drug costs were reduced to levels similar to the United Kingdom.38 The prices for MS drugs in the United Kingdom, Canada, and Australia, and the more controlled drug costs in large integrated health care systems, such as the VA, suggest that solutions are possible. A flourishing pharmaceutical industry provides invaluable benefit to society by developing new drugs to combat disease and alleviate suffering. The success of the pharmaceutical industry in bringing new therapies to market for the treatment of MS has improved the care of people with MS. However, the unbridled rise in the cost of MS drugs has resulted in large profit margins and the creation of an industry “too big to fail.” It is time for neurologists to begin a national conversation about unsustainable and suffocating drug costs for people with MS—otherwise we are failing our patients and society. Daniel M. Hartung: contributed to study design, acquired data, supervised statistical analysis, interpreted the results, drafted and critically revised the manuscript. Dennis N. Bourdette: conceived the study question, contributed to study design and interpretation of results, and critically revised the manuscript. Sharia M. Ahmed: contributed to study design, statistical analysis, interpretation of results, and editing of manuscript. Ruth H. Whitham: conceived the study question, contributed to study design and interpretation of results, drafted and critically revised the manuscript. D. Hartung reports no disclosures. D. Bourdette has served as a consultant for Teva Neurosciences and Biogen Idec and has had research grants from the Department of Veterans Affairs, National MS Society, and NIH. S. Ahmed reports no disclosures relevant to the manuscript. R. Whitham reports serving on the Independent Data Monitoring Committee for a clinical trial sponsored by Chugai Pharmaceutical Co. Go to Neurology.org for full disclosures. The authors thank Sheila Markwardt, BS, for assistance with statistical analysis. Go to Neurology.org for full disclosures. Funding information and disclosures deemed relevant by the authors, if any, are provided at the end of the article. The Article Processing Charge was paid by OHSU Department of Neurology. Accepted in final form January 15, 2015. IMS Health. Top Therapeutic Classes by Non-discounted Spending (U.S.). Available at: http://www.imshealth.com/deployedfiles/imshealth/Global/Content/Corporate/Press%20Room/2012_U.S/Top_Therapeutic_Classes_by_Non-Discounted_Spending.U.S.pdf. Accessed April 9, 2014.
. Costs and quality of life in multiple sclerosis: a cross-sectional study in the United States. Neurology 2006;66:1696–1702. FDB MedKnowledge™. San Francisco, CA: First Databank; 2014.
. Supreme Court to hear appeal of generic drug case. New York Times. April 1, 2014:B3.
. Multiple sclerosis drugs: sticker shock. Ann Neurol 2012;71:A5–A6.
. Immunotherapy and multiple sclerosis: the devil is in the details. Neurology 2010;74:1410–1411.
. The use of mitoxantrone (Novantrone) for the treatment of multiple sclerosis: report of the Therapeutics and Technology Assessment Subcommittee of the American Academy of Neurology. Neurology 2003;61:1332–1338. AMCP guide to pharmaceutical payment methods, 2009 update (version 2.0). J Manag Care Pharm 2009;15:S3–S57, quiz S58–61. Department of Health and Human Services, Office of the Inspector General. Medicaid Drug Price Comparison: Average Sales Price to Average Wholesale Price. Washington, DC: Department of Health and Human Services, Office of the Inspector General; 2005. Bureau of Labor Statistics. Consumer Price Index Databases [online]. Available at: http://www.bls.gov/cpi/data.htm. Accessed November 11, 2013.
. Segmented regression analysis of interrupted time series studies in medication use research. J Clin Pharm Ther 2002;27:299–309.
. Introductory Econometrics: A Modern Approach. Mason, OH: South-Western Cengage Learning; 2009. British Medical Association and the Royal Pharmaceutical Society of Great Britain. British National Formulary, 66th ed. London: BMJ Publishing Group; 2013–2014. Drug Benefit Prices (DBPs) for Products Reimbursed Under the Exceptional Access Program [online]. Available at: http://www.health.gov.on.ca/en/pro/programs/drugs/odbf/odbf_except_access.aspx. Accessed November 7, 2013. Australian Department of Health. Pharmaceutical Benefits Scheme (PBS). Available at: http://www.pbs.gov.au/pbs/home. Accessed March 15, 2015. Pharmacy Benefits Management Services [online]. Available at: http://www.pbm.va.gov/PBM/PharmaceuticalPrices.asp. Accessed August 11, 2014. Medicaid Drug Price Comparisons: Average Manufacturer Price to Published Prices. Washington, DC: Department of Health and Human Services; 2005. States' Collection of Rebates for Drugs Paid Through Medicaid Managed Care Organizations. Washington, DC: Department of Health and Human Services; 2012.
. The impact and evolution of Medicare Part D. N Engl J Med 2014;371:693–695. The price of drugs for chronic myeloid leukemia (CML) is a reflection of the unsustainable prices of cancer drugs: from the perspective of a large group of CML experts. Blood 2013;121:4439–4442.
. The upward spiral of drug costs: a time series analysis of drugs used in the treatment of hemophilia. Thromb Haemost 2002;88:545–553.
. Strategies and impacts of new drug introduction: hemophilia treatment. J Health Care Finance 2004;31:1–12.
. Price and market-share competition of anti-ulcer gastric medications in the Ohio Medicaid market. Int J Pharm Med 2004;18:271–282.
. Strategic pricing of new pharmaceuticals. Rev Econ Stat 1998;80:108–118. Congressional Budget Office. How Increased Competition from Generic Drugs Has Affected Prices and Returns in the Pharmaceutical Industry. Washington, DC: US Government Printing Office; 1998.
. Increasing generic drug use in Medicare Part D: the role of government. J Am Geriatr Soc 2007;55:1106–1109.
. Regulatory and cost barriers are likely to limit biosimilar development and expected savings in the near future. Health Aff 2014;33:1048–1057.
. America's other drug problem: how the drug industry distorts medicine and politics. New Repub 2002;227:27–41.
. Teva Asks Supreme Court To Delay Possible Release of Generic Copaxone. Wall Street Journal. April 7, 2014. Available at: http://www.wsj.com/articles/SB10001424052702304819004579487430240670484. Accessed April 15, 2015.
. Biomedical patents and the public's health: is there a role for eminent domain? JAMA 2006;295:434–437.
. Avoidance of generic competition by Abbott Laboratories' fenofibrate franchise. Arch Intern Med 2012;172:724–730.
. Approaches to the management of agents used for the treatment of multiple sclerosis: consensus statements from a panel of U.S. managed care pharmacists and physicians. J Manag Care Pharm 2012;18:54–62.
. Managed care aspects of managing multiple sclerosis. Am J Manag Care 2013;19:s307–312.
. New expensive treatments for hepatitis C infection. JAMA 2014;312:593–594.
. Limits on Medicare's ability to control rising spending on cancer drugs. N Engl J Med 2009;360:626–633.
. Pricing for orphan drugs: will the market bear what society cannot? JAMA 2013;310:1343–1344.
. Cost-effectiveness of multiple sclerosis disease-modifying therapies: a systematic review of the literature. Autoimmune Dis 2012;2012:784364.
. Cost-effectiveness of disease-modifying therapy for multiple sclerosis: a population-based study. Neurology 2011;77:355–363.
. What does the value of modern medicine say about the $50,000 per quality-adjusted life-year decision rule? Med Care 2008;46:349–356.
. Comparing the cost-effectiveness of disease-modifying drugs for the first-line treatment of relapsing-remitting multiple sclerosis. J Manag Care Pharm 2009;15:543–555.